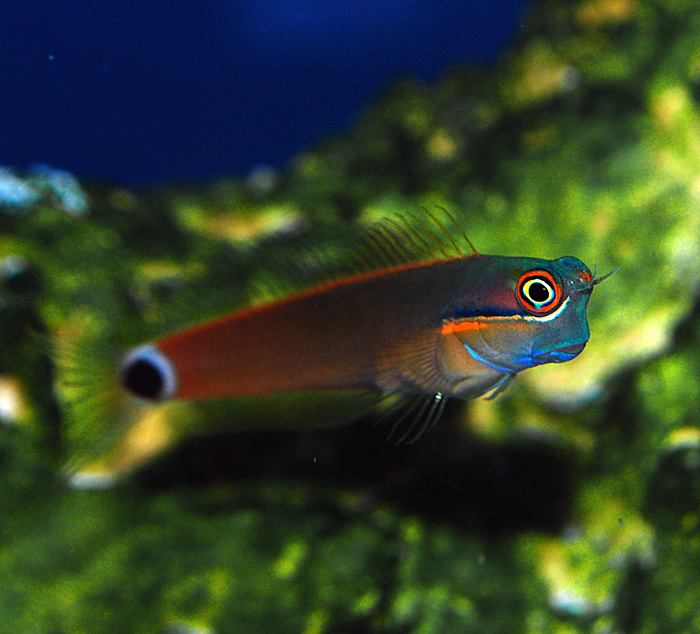 One of the smallest blennies available for the aquarium trade, the tailspot blenny is a popular species for reefs. They’re entertaining to watch and have a subtle beauty with a striking orange and black stripe below each eye and a black eye spot on the caudal peduncle. This tiny species does well in nano tanks of at least ten gallons when they contain enough live rock for grazing and hiding. Do not house it with large, aggressive species. They’re generally very peaceful, but may fight with similar blennies in small tanks. They appreciate feedings of prepared herbivore preparations and Spirulina brine shrimp.